Unreliable Haaretz, also termed ‘al-Haaretz’ and ‘Israel’s anti-Semitic Rag’, which fuels anti-Israel bias; aids the Arab terrorist enemy and was even convicted of anti-Israel spy charges (and biased BBC, admittedly anti-Christian biasedcopies it), just like that drag queen/drama queen Ahmad Tibi ( accused of being himslef the real racist are so quick to falsely brand worried Israelis of racist Arab attacks (Israelis aren’t ‘racist’ – they’re worried) as “racism” but will never name the Goliath Arab racism / Islamic bigotry that seeks out to attack Jews – by Israeli-Arabs or Palestinian-Arabs. ( It’s about the bigotry). Apparently, sick Haaretz also finds Arab regimes, including “Palestinian” who either succeeded in complete ethnic cleansing of Jews or seek its completion – more desirable than Jews who dare attempt to survive against it. Thus, a search for ‘racism’ in Haaretz, won’t find it related to the racist attacker, but rather almost exclusively to the receiving end victim of the intolerance monster. Ha’aretz Fuels Anti-Israel Bias See now CAMERA’s additions to the NOT too respectful list of unreliable Haaretz journalists who are predictable Israel-bashers . Levy has been the guiding light of the left-wing newspaper that has waged a war against the “occupation” as the cause of most, if not all of all, of Israel’s problems with Arabs. The newspaper also has championed further concessions to the Palestinian Authority, has campaigned for allowing illegal Bedouin villages to remain standing and against deporting illegal African immigrants. Encouraging the growth of non-Jewish populations is in line with a left-wing agenda to prevent the likelihood of a religious Jewish majority in Israel in the near future. Levy’s latest onslaught against Israel was published in the Independent, a newspaper with a long history of anti-Israel articles. However, the interview is filled with inaccuracies and fiction, to which Ben Dror Yemini of Maariv responded at length. 8 Apr 2010 – The spy case revealed in April 2010 began in late 2008. Here’s the story of how the case unfolded, and the dangers it still poses. Gideon Levy has reproduced a series of hit-and-run columns dispatched from Gaza that bash at the problem without solving it. PHOTO: MCT Israel’s internal critics fancy themselves modern prophets, boldly speaking truth to power. Haaretz columnist Gideon Levy’s new book The Punishment of Gaza denounces Israel for imposing “futile bloodshed and destruction… humiliation, destitution, deprivation and bereavement” on Palestinians. But Levy, like many of his comrades, undermines his credibility by lacking the prophet’s faith in the power of truth. His harsh, one-sided repudiation ignores the messy, multidimensional complexities that keep the region mired in violence. As a result, his book becomes the latest round in Israel-bashing, all too easily dismissed, rather than the important call to conscience he hoped to write. Another “gem” from Haaretz – pro-Arab racism media Here’s another “contribution” by the infamous anti-Israel “Israeli” newspaper Haaretz [Gideon Levy], supporting the Jihadi butchers – racist Arabs of Hamas. Anyone still thinks Haaretz is a “reliable source” on Israeli vs Arabs matters? Let’s not spin this blunt issue, aiming at Israeli Jews specifically to be killed or hurt, in their homes, in cars passing by, in a restaurant , at a bus stop, at kindergartens, is what it is: racial hatred against Jews. I don’t know which racist part of it is difficult to comprehend to cast it as such. Arab Muslim leaders such as the head of the Islamic movement was arrested and charged of racism and inciting violence, to assume that his ‘deadly’ influence doesn’t “live” on among Israeli Arabs is beyond naive. One of the icons of pushing racism is Arab MK Ahmed Tibi, whose inflammatory mouth has uttered the word “racist” and “apartheid” for almost as many days [in the decade or so] he’s serving as an official in the Jewish-Democratic state. Speaking of hypocrisy, Arab republics and Islamic Republics are also against the notion of a ‘Jewish’ state, even though Israel’s official laws are in fact anything but Jewish. In addition, a fairly new pehenomenon follows this twisted line, a form of bigotry that doesn’t even recognize in Jews’ rights to defend themselves, the message basically is that if you are an Israeli Jew, you simply deserve to die -by default- and if/when you resist, you are a “racist.” An underline message that is common to all those anti-Israel organizations that, though publicly, claim to “care” for the Palestinian-Arabs. The political motivated left in Israel says, said some outrageous things in order to ‘win’ symbolic [and beyond] politics. They make sure to use the “racism” slur at each right wing step it takes to deter it from advancing. Preying on the weakness of the sensitivity to the charge, the Jewish people feel about – probably more than any other nation – the very victim of racism (most recent WW2’s Nazis and the Arab-Islamic leaders like the Mufti of Palestine that joined them) they managed to use it or rather abuse it to advance their lefty ideology on the back of super-guilt ridden Jews, all the while successfully suppressing the real racism going on in the past and in the present, Arab racism that is, from outside or from inside Israel. Try this, perform a search in Haaretz for ‘Arab racism’ see what comes up, if not the exact opposite, How come? 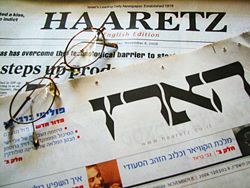 The sad thing is, Haaretz writers and the like, never learned that exaggerated use of outrageous terminology does more of a serious damage than one might assume, and long after they might have forgotten about their political motivated hype language at a ‘heated moment,’ its disastrous effect continue to be deep and long in the nation’s psyche, precisely because it uses the concept of intolerance, which Jews are so fiery against. As goes the above factors and “racism pushers” as I like to call them, so does the overall tension. Israeli newspaper Haaretz drastically skewed the results of a survey and falsely portrayed Israeli-Jews as racists and as supporters of apartheid.These false survey findings were picked up by news outlets around the world. Gideon Levy of Haaretz – who is known for exhibiting bias and falsely accusing Israel – reported the findings of a Haaretz survey that asked Israeli-Jews about their opinions of Israel’s policies toward the Palestinians. Presspectiva, an Israeli media watchdog, investigated the survey’s findings and found that Levy reported the results in a misleading fashion and even lied about what survey participants said. For example, the survey asked participants about their opinions on allowing the 2.5 million Palestinians in the West Bank to vote in Israeli elections if Israel were to annex the West Bank. Levy reported that 69 percent of respondents oppose Palestinians voting in Israeli elections, and thus concluded that “most of the Jewish public in Israel supports the establishment of an apartheid regime in Israel if it formally annexes the West Bank.” However, as The Algemeiner discusses, this is very misleading, as Levy leaves out the fact that most Israelis oppose annexing the West Bank. Levy also fails to mention that Israeli-Arab citizens may use these roads as they please; the roads are only separated based off citizenship, meaning only non-citizens must use separate roads. He also never mentions the fact that these separate roads exist because Palestinian terrorists fired on Israeli citizens when the roads were shared. Gideon Levy and Haaretz reported the findings of their survey by distorting the facts and falsely accusing Israeli-Jews. These false findings have been picked up by media outlets around the world, giving anti-Semites and biased critics of Israel more fuel to demonize the Jewish state and the Jewish people.